In celebration of the fall season and fall flavors, today we’re making vegan pumpkin french toast. 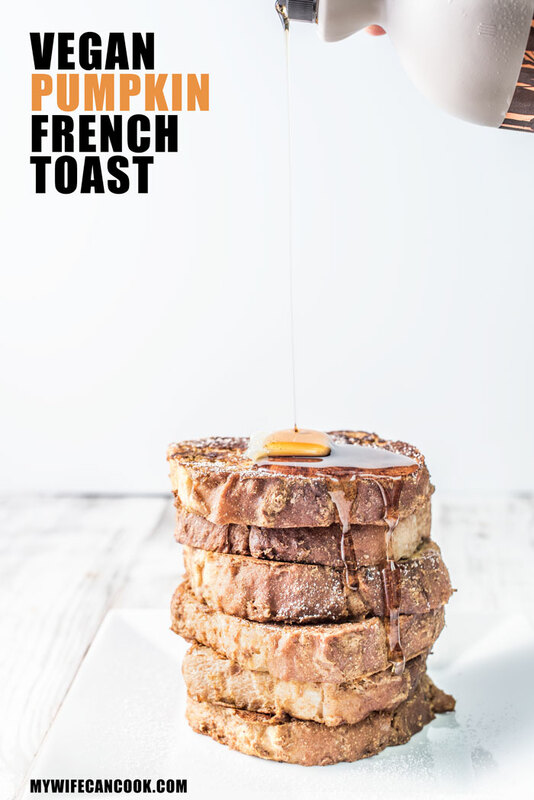 So open up those windows, soak in the fall breeze (if you’ve got one), and read on for our vegan pumpkin french toast recipe and tips. We woke up this morning a wonderful cool breeze blowing through the windows and, for the first time, it feels as though fall has really arrived. We really love this time of year; the cooler temperature, the disappearance of summer mosquitos and the large summer electric bill (we tend to crank the AC), and the onset of fall flavors. 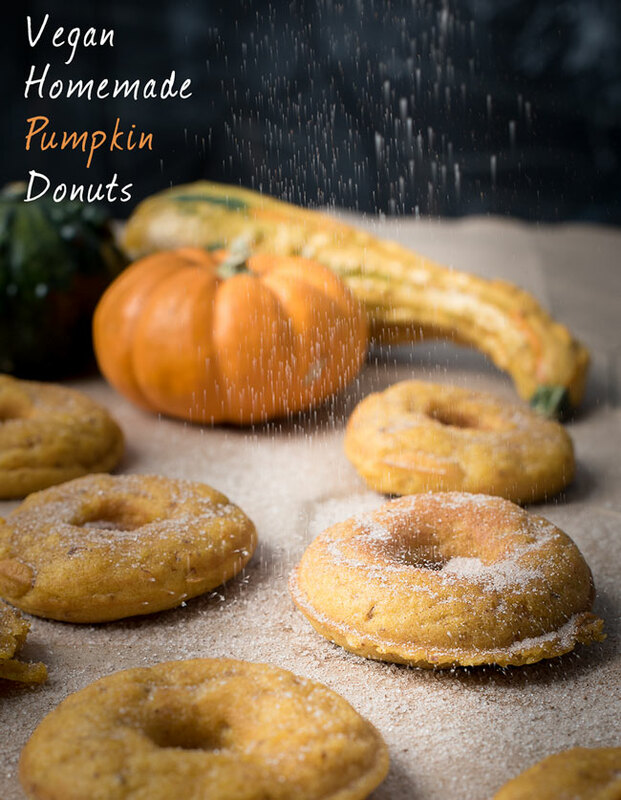 We have to resist the temptation to put apple and pumpkin in everything! But they are great flavors and we love to celebrate fall by working them into a lot of our fall recipes like these spelt pumpkin waffles and these pumpkin cupcakes. French toast is a really great comfort breakfast. It can be really decadent like this spiced french toast or this baked panettone french toast. Those both looked great, but we decided to come up with a vegan french toast recipe. As a milk substitute, we decided to use almond milk. Other good non-dairy vegan substitutes for milk include soy milk, rice milk, hemp milk, and cashew milk. Soy milk is easy to find, but we tend to prefer the creamy consistency and nutty taste you get from things like almond milk and cashew milk so we decided to go with cashew milk. It worked out really well and we love how it adds to the flavor profile. 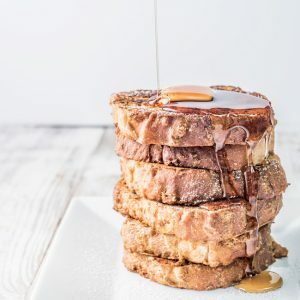 Just about anything could work, but when choosing a bread for french toast it’s best to pick a bread that’s sturdy enough to hold up during cooking, but also spongy enough to take on more of the moisture. Lots of things could work, but it might be best to stay away from the thinly sliced bread you find in the supermarket isle. A brioche or something similar could work really well. For our vegan pumpkin french toast we just found a freshly baked loaf at our local farmer’s market and then cut it into fairly thick slices. If you cut it too thin it’s more likely to fall apart so go for some nice thick slices. 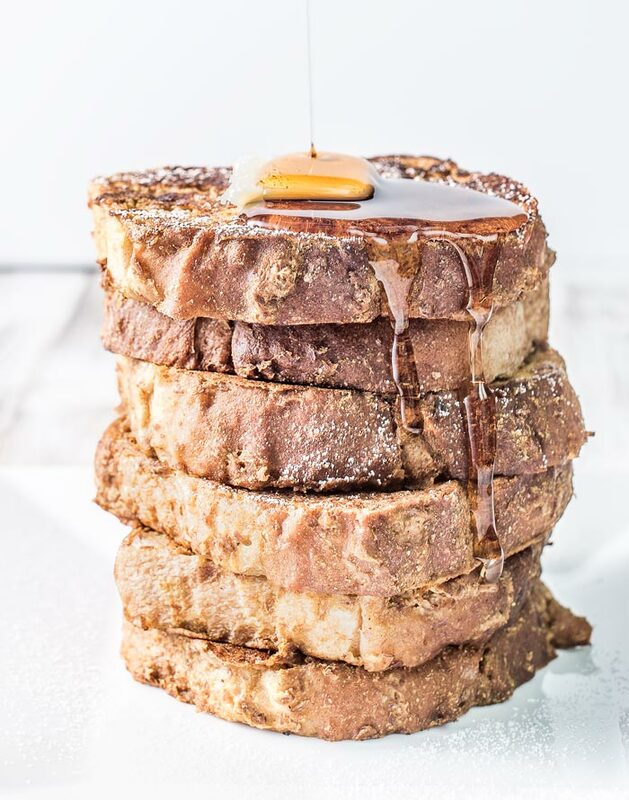 For the finishing touch over this vegan pumpkin french toast we feel like maple syrup is a must…we love our maple syrup! But if you want to make your french toast extra special we also recommend toasted pecans. This is an optional step, of course, but a great addition if you want to splurge. So good! 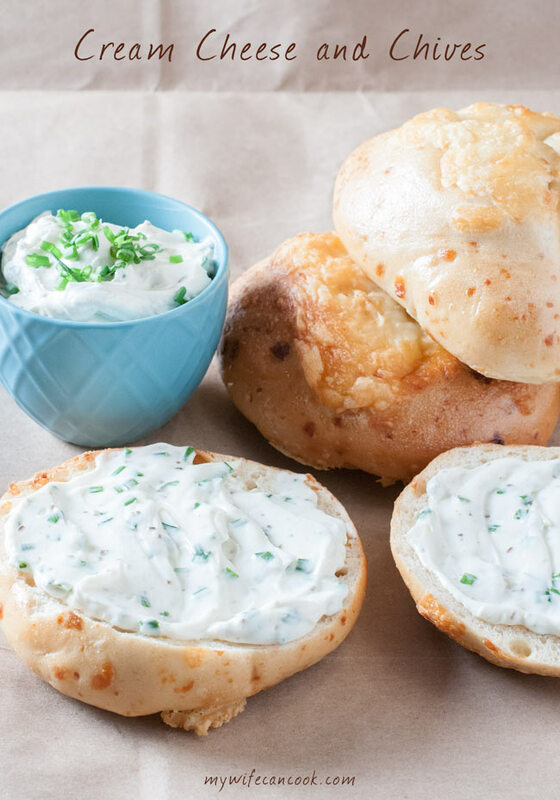 Mix together all ingredients except bread. Dip each slice of bread in pumpkin mixture, place on a sheet pan, pour any remaining pumpkin mixture on top, and let sit for 5-10 minutes. Heat large non-stick pan on medium low. Grease pan with a small amount of vegan butter or oil and cook each slice for 2-3 minutes per side. 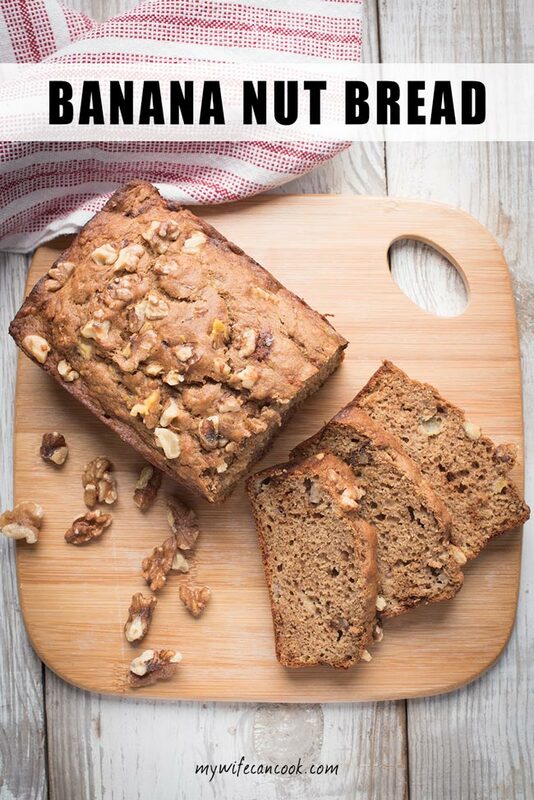 Serve with maple syrup, toasted pecans, or your favorite french toast toppings.